Hey guys, how you all there. i’m here with a good news for you all. As you all know that I come with new ideas each and every day, now today is another day. I’m sure that this article would be useful for all Xiaomi, Mi3, Mi4, Redmi IS as well as note users. Therefore, if you are a user of the above listed devices and you really want to download some tremendous apps and games on the Google play store but you couldn’t do so, all because Google play store is not meant for your device as a default store. Well you have no cause to worry about anything, because what you are looking for is right in your finger tips. In this article I’m going to be given guides on how to install Google play on Xiaomi, Mi3, Mi4, Redmi 1S as well as Notes. This guides I will be giving are very simple and straight forward to follow, I’ve broken it down to the barest minimum for us to assimilate easily. But before I proceed I will start by letting us know what will be required by Xiaomi, Mi3, Mi4, Redmi 1S, Note before you can be able to install Google play store app on it. Before you could install Google play store application on your Xiaomi Mi3, Mi4 or Redmi 1S Note Android smartphone you will need a good and strong internet signal. Before you could download Google play store on your Xiaomi device you need to follow the guides below. 1. Enable installation from unknown source from you Xiaomi phone. 2. After you’ve enabled installation from unknown source, you can open and search for Google plays store apk download on your Xiaomi phone browser. 3. Immediately after successful download just open the complete download message to start installation on your device. 4. After Google play store has been successfully downloaded on your Xiomi phone, make sure you restart your device. Now that that Google play store is successfully installed on your phone. 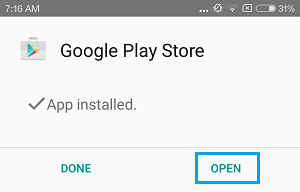 Launch the app and log in using your Google account to start downloading apps in the store. Note: The guides I mentioned above are the shortest and simplest guide’s in order to install Google play store on Xiaomi devices. The guides are for all the Xiaomi devices. If you are using Mi 3, Mi 4; you can as well use the guides above. I hope with the above guides, you can now find it easy to download and install Google play store on your install Google play store on your Xiaomi Phone, Mi3, Mi4 or Redmi 1S Note. Thanks and stay tuned for more useful tips and guides by us.